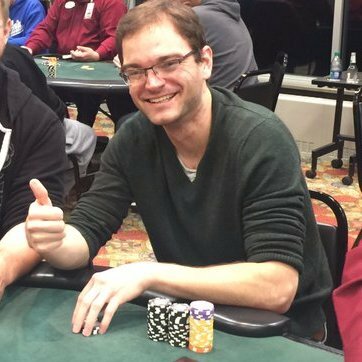 John Reading was kind enough to answer a few questions for us in some rare Vegas downtime for him this summer — get to know one of Minnesota’s few WSOP bracelet winners, and additionally, the 3rd place finisher in PIFT’s Event #1: $450 “Winners Shown” last fall. You can also follow him on twitter @KiKaMo88. Schneids: Tell us a little bit about your poker playing history—how long, how often, what got you into poker, etc? John: I became interested in poker when I first saw the WPT on the travel channel and the WSOP on ESPN back in 2004-2006. I began playing myself by grinding free roll tournaments online sites used to attract new players during the poker boom. If you got top 10 in these tourneys out of 500-1000 you made $2 to $100 which you could use at real money tables. When I got one of these scores I would take it to the cash tables and tried to run it up. I made several hundred from running up these free rolls wins on various occasions but also lost it back multiple times. However it never cost me any actual money to play and was a great way to learn for no actual cost to myself. When I turned 18 I started buying into tournaments myself such as the $10 rebuy on Stars, 180 player sit and goes and grinding the shootout or mega sats to the $215 Sunday million. My first big score was $5800ish which I got by getting 7th in a Sunday $215 second chance on Stars. This was a score equivalent to 1.5 times my life roll at the time, saved up from the last 18 years, so it was incredibly significant to me. But, since I was inexperienced and had feelings of invincibility at the time, I naturally played some much higher stake games within the next month and went broke, both life roll and bankroll. I then worked at McDonalds for the summer to get some of it back and, not going into too many details, it was a rough job. Fortunately I worked at the Rochester Public Library after that summer, for the whole next year when I was a senior in high school, which was more relaxing. After that year I had gotten back the 4K for my life roll but still didn’t have the immediate confidence to start up again quite yet. I then went to my freshman year of college and didn’t play any poker at the time but did party a lot. It was a great year. Then I went home for the summer and set a limit for myself to only put $50 on each week and grind. On the 3rd week of this i got 3rd in the 10 dollar nightly rebuy on stars for about 7k so I now had my bankroll all back plus another 1k. To reward myself I bought in directly to the Sunday million and took 500th or something for $500 but I wasn’t done yet. I decided to play the $215 rebuy that day but told myself I could not rebuy or add on in the tourney–obviously putting me at a significant disadvantage. However the stars aligned that day and I ended up shipping it for $58,000. I remember being in disbelief about this score for the next like four months but eventually got my head around it. From there though I have definitely had some ups and downs but that was the ultimate turning point to play this as a side profession instead of just a hobby. I still finished college and grad school over the last ten years but about 98% of all the income I have ever made has come through poker and it has been an incredible experience and given me many opportunities I would not have otherwise. Schneids: Fantastic story of not getting discourage and sticking at it! Do you have any favorite local or national poker superheroes or anyone who you credit for helping the development of your poker game or interest in poker? What traits do you most accredit to the success you’ve had playing poker? John: Until about 2010 I really didn’t know any of the big poker names in MN or the rest of the world really besides the online phenoms because I only played online. 2010-2012 is when I started to become friends with other poker players because before that I just was mostly a solo act living two separate lives. I am much happier now that I integrated my poker life and outside life more and have friends which accept both. For a long time everyone I knew friends/family was trying to discourage me or shame me from playing. Fortunately I had a strong passion for the game so I became resilient to this adversity and kept playing/studying. Resiliency, determination, strong sense of self, controlled risk taker, intuitive, good analyzer of imperfect information, and learning how to be solely accountable for ones actions without blaming outside factors, are characteristics I’ve worked on which I believe are extremely important to become a good poker player. Schneids: That all rings so true. Let’s change gears now — you get to fill a table with whoever you want, living or dead, who’s invited and what is being played? John: I would honestly just want to play with deep thinkers from all walks of life because I am one who enjoys a stimulating table talk conversation when it occurs. If I would pick some specific people I would choose Aristotle, Plato, Ghandi, Einstein, Tesla, and Elon Musk and that is only a few, there would be many more I would be interested in playing with. Schneids: Since we’re traveling back in time with a lot of your picks for a dream poker table, take me back to the day you won your WSOP bracelet — was there any specific time during the event where it hit you “this can really happen?” Any moments in time after the final river card was dealt and you were the champ that still stick with you? Schneids: For sure, nothing better than playing in front of a supportive rail with the chance to win a lot of money. Moving away from poker, what activities do you enjoy away from the felt? John: I love watching anime actually, it is a big hobby of mine away from the felt. I like skiing and snowboarding too but that can only be done seasonally. Schneids: I understand you have a masters in counseling psychology, do you think being so well-versed in psychology has added any hidden benefits to your poker game? John: I feel psychology and my own personal development has been a key asset in my ability to play poker and adapted into a unique set of skills at the poker table. I had an interesting childhood to say the least, and it definitely grew me into the person I have become today so I would not have it any other way. Schneids: Thank you so much for taking the time to answer a few questions, and I wish you the best of luck for the rest of your time in Vegas this month!